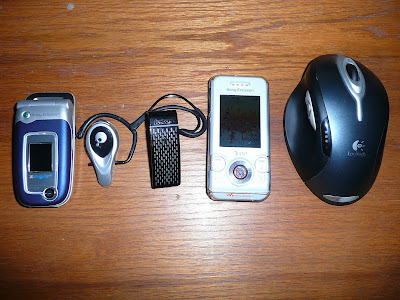 I got myself a new Bluetooth headset and a new cell phone... Primarily, because my old headset's battery had to be charged every other day--too often to my liking. 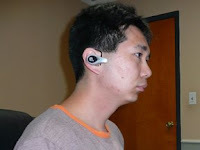 So I bought the Aliph Jawbone, CNet's highest rated Bluetooth headset for cell phones. It has such a high rating for two things--"Noise Shield" and "Audio Enhancement." Both work great. 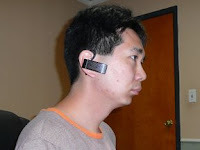 However, there are several caveats to using the headset. As you can see from the above picture, the top cover came off. How did this happen? While trying to remove the charger. Chalk this one to bad design and lack of documentation. There's no "release button" or anything like that on the charger, but you're not supposed to just pull the thing off the headset, despite there being no instructions on charger removal in the owner's manual. Only after contacting their support staff, am I given proper instructions for removal. With the top of the Jawbone facing up, hold the Jawbone in one hand. With your other hand, grasp the cap of the USB charger cable on the top and bottom (not the sides) with your thumb and forefinger. 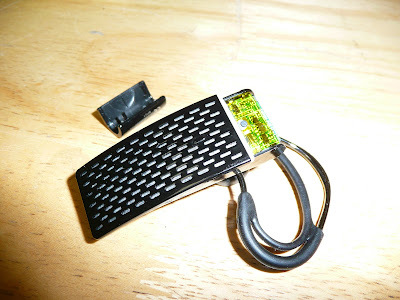 Gently bend the cap of the USB charger cable downward and away until the Jawbone is disengaged. Without these instructions (which, as of this posting, cannot even be found in the FAQ section of their website), you're likely going to get the top pulled off eventually. All of the "professional" reviews I've read for the Jawbone talk about how good the Jawbone looks. I do not concur. They also do concede on its large, bulky size. On that, I do concur. 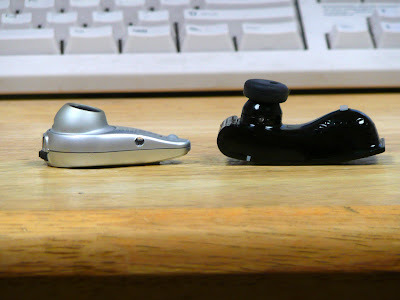 As you can see, not only is the Jawbone larger in terms of surface area, it is also much thicker. Not surprisingly, the Jawbone looks huge when worn properly. Still, the most important thing about a headset is that it should work properly. Looks are secondary. As I've mentioned earlier, what this unit is top-rated for, works great. Also, despite its apparent size, it's still quite light--at 0.5 ounces, it is by no means heavy. Noise Shield--Jawbone identifies your voice (through an "activity sensor" that must make contact with your face), and eliminates virtually all other sounds, so the other side of the line can hear exactly what you're saying. Audio Enhancement--Jawbone monitors the volume of the noise around you, and adjusts the volume of the headset accordingly, so that you should be able to hear your call even if you're surrounded by loud noises. But that brings us to the next caveat. Jawbone is apparently very susceptible to the many radio frequencies around us, as after pairing it with my Z520a (a Cingular phone, which Jawbone all but promised to work well with), it would constantly drop the Bluetooth connection--even though they are sitting right next to each other. After the connection is dropped, the phone will try to find it again, and reconnect, only to have the connection drop again 20 seconds later. This often continues for 10 to 20 minutes, until the phone finally gives up trying. During this time, however, the phone's battery is considerably drained. Whereas before, I could keep the phone on standby for about 4 days before I had to charge it again, with the constant searching of the Bluetooth device, the battery needs to be charged again the very next day... which rather defeats my purpose in getting a new Bluetooth headset. And since the Z520a never dropped the connection to my previous two Bluetooth headsets, I know the problem is not the phone. However, upon getting a new phone--I was up for a free upgrade, and wanted a new phone anyway--Jawbone does work much better with it, and hasn't dropped the connection once... it basically means anyone buying the Jawbone has to be very careful about what phone they have, as I've read about many other phones that don't pair well with Jawbone. As mentioned earlier, I've contact their support staff--more about the broken cover than about the Bluetooth connection. Although they were initially very quick to respond, giving me instructions on requesting an RMA, they've yet to respond to the RMA request, even though they mentioned that I should be getting a response within one business day. Two business days later, I still had no response.